Cloth Diapering Mamas Rejoice! Part 2: Remove Diaper Cream from Diapers! 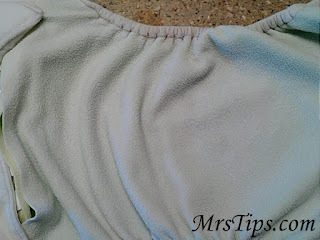 You CAN remove Desitin, Calmoseptine and other diaper cream build-up residue from microfiber diaper fleece! I know because I did it today! Here's the story: I recently started putting Miss Tips in the large diapers since her legs were getting sores from the mediums being too small for her now (she is almost 18 months now - and I had my son in large diapers from the time he was about 14 months old). On Saturday her diaper leaked completely through to her jeans and when Tips changed her diaper he said the fleece was completely dry. Ugh! We wondered if the person I lent these diapers to had forgotten my admonition to her to NOT use fabric softener, so Saturday night Tips did a Dawn strip. When I took the diapers out of the dryer this morning I decided to put the fleece side under the tap while I ran water on it. After I filled up the diaper, I waited to see if the water completely soaked the microfiber or if there were build-up spots. Oh yeah.... there's some Desitin/Calmoseptine build-up there. If you can't tell in the picture, the fleece is completely soaked with water and the white spots? That's the build-up from when I was using Calmoseptine and Desitin to help heal a bad diaper rash from his toxic teething poo. Most of the time I used bio-soft liners when I was going to use diaper cream, but sometimes I didn't have them in the diaper bag, or a babysitter put it on, or worst of all, in my naivete/rationalization I thought that smearing it on lightly wouldn't do as much damage. It did. So after I realized there was still build-up on the diapers, this FANTASTIC idea came to me as I was trying to think of what de-greaser cleaners we had in our house, "Why don't you try using the de-greaser ration of Advanage?" So I headed to dig out the Advanage cleaner and spray bottle and figure out what ratio to use. I opted to use the same ratio as it calls for when you want to get the dirt/grease/oil ring out of shirt collars, which is one step stronger than what it calls for when cleaning ovens and grills! 2:1 ratio it is! After doing this for all the diapers I stuck them back in my washer and ran a "Quick Clean" hot water cycle on the diapers. They still had a lot of suds so I ran them again on a "Heavy clean" hot water cycle and this time there were no more suds - so I dried them. Then I ran each one under the sink again to see if there were any remaining spots, which there were some on all the diapers but two of them and I am sure it is because I got those spots scrubbed with the brush. So far so good. I'll write an update tomorrow to let you know if my daughter goes an entire day in those diapers without the diapers leaking through to her clothes! But until then I'm saying that this "Myth" of not being able to remove Desitin or other diaper rash creams from cloth diapers as being "Busted"
P.S. I think this helped remove some of the stains from my cloth diapers too. Advanage really IS a wonder cleaner! And to think, the first bottle I bought 4 years ago was from a door-to-door salesman and I'm SO glad I restocked this last summer when they came by our new house. I will definitely keep buying from them when they come by again! I am currently dealing with the same problem you were dealing with a year ago. What an incredible relief to find your blog post! I have tried sooo many things so far, to no avail. Which Advanage did you use? The one for carpet and fabric or the degreaser or some other kind? As soon as I know I'm purchasing it! Thanks for sharing your trials and victories!